All Prices are Correct, Fixed and Up-to-Date. Please don’t call to discuss prices already shown below. Please note we are not looking to be a “cheap” contractor. We have a company policy of do it once, do it right. We use the best of fit out material, and work to the highest standards. No VAT to pay as not currently registered for VAT. Testing and certification. All our testing services are prepaid and discounted at the prepaid rate. Evening EICR’s or Saturday are available by request. All home owners must have a hard wired smoke alarm system fitted by 2021. We fit only AICO alarms due to reliability over many years installing them. Please email us today HERE with your requirements! The 18th Edition regulations came into effect in January 2019 we fit only high quality 18TH edition Fuse boards/Fuse boxes/Consumer units. For all other electrical installation work please fill in the form and I will come back to you same day. 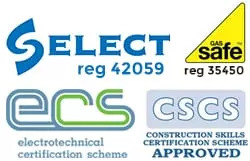 EICR Edinburgh Insurance and Accreditation. Please note all prices are subject to change and situation.